2K and Gearbox Software plan to bring Borderlands fans deeper into Pandora than every before on December 14, when a retooled version of Borderlands 2 launches on PlayStation VR. Who’s up for some cel shaded motion sickness? More than just the original game with a new control scheme, Borderlands 2 VR has been significantly reworked in order to make it virtual reality friendly. A new game mechanic, called “BAMF Time” (or “BadAss Mega Fun Time”) slows down the action, allowing players to dodge bullets and perform other cool maneuvers. Driving vehicles now happens in first-person, with weapons controlled by head movement, and players can choose between standard controller movement or that new VR standard, point-to-point teleportation. First-person driving with head-aimed weapons? Count me delightfully queasy! And this version of Borderlands 2 is a single player experience, which means Vault Hunter skills that rely on teamwork are out. Maya’s “Res” ability, for example, is now something called “Empathy,” which eats her health and damages enemies, with extra bonus of doubling healing during BAMF time. 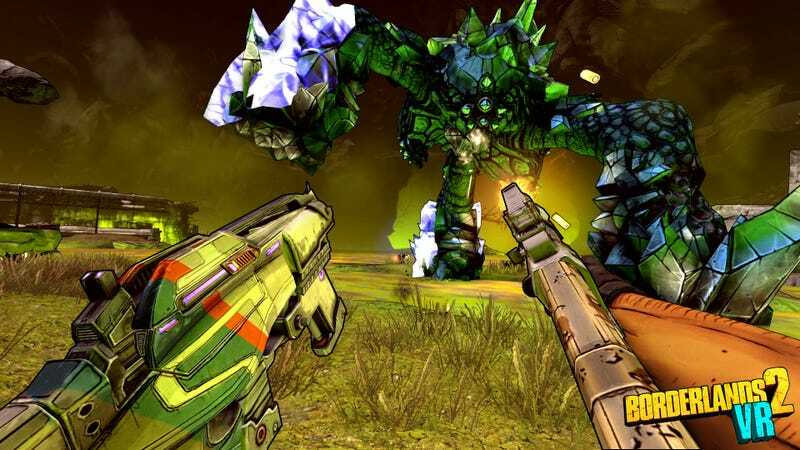 Changes aside, Borderlands 2 VR looks to be a more up-close and personal version of the original. Harvesting full-sized weapons out of treasure chests, getting so close to enemies you can almost smell them — sounds like a good time. Borderlands 2 VR arrives on PlayStation VR on December 14.